This high protein black bean brownies recipe and post is sponsored by Acorn. We are always looking for delicious low carb and high protein recipes and this high protein black bean brownies recipe is a new favorite! I already know that black beans offer the texture and high protein I want, but considering our goals of gaining more muscle and increasing our protein with our recent dietary choices, the idea of including a protein powder in this recipe appealed to me. When I was invited by Acorn and Walmart to check out the Purely Inspired® organic protein powder and Mission1™ bars this month, I knew just what I wanted to make. When you are looking for a delicious low carb and low sugar treat, black bean brownies are a great choice. You can easily make them without flour, and the extra protein of the beans is ideal for helping build strong muscles, keep you satisfied longer and of course ultimately burn fat. Adding 6 scoops of Purely Inspired® organic protein powder available at Walmart into your classic recipe is just another level of health improvement. It makes having a high protein snack so much easier to manage! While there are many protein powders out there to choose from, very rarely do you find one made with all organic ingredients. Since this is super important to our family, picking the Purely Inspired® brand is ideal. It’s affordable at only $19.97, tastes great in smoothies (or other recipes) and, of course, is free of all the nasty chemicals we don’t like putting into our bodies. We love that is is made from vegan plant proteins so all of our friends can enjoy without any problems! It is smooth and mixes seamlessly into our recipe. To me, one of the best things was how I can grab at my local Walmart when shopping for other items instead of going to a specialty store or ordering online! 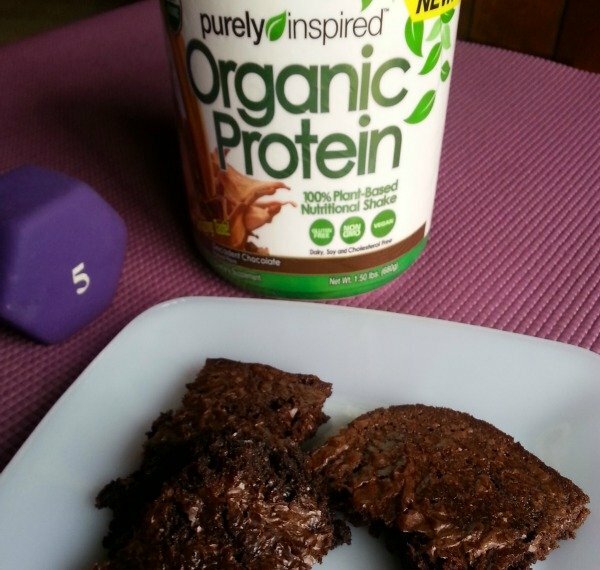 Chocolate + Protein = Delicious Brownie Treat! Eating a snack before or after a workout is a great way for us to stay healthy and have plenty of energy, but I honestly don’t always have the time to drink an entire smoothie or shake that has been enriched with protein powder. Now I have not just one, but two great options. I can make my own tasty and simple high protein black bean brownies and grab one before or after a workout. Or, I can grab one of the great Mission1™ protein bars and toss into my gym bag! 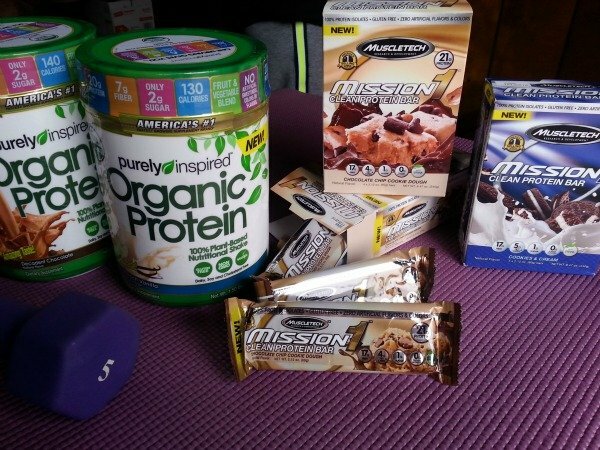 We had the chance with this opportunity to test out not just the Chocolate and Vanilla Purely Inspired® organic protein powder, but the Mission1™ protein bars in both cookies & cream and chocolate chip cookie dough. I expect that you sense a theme here. Chocolate is definitely a must in our home, and being able to have it in a healthier way? Totally down for that! Many protein powders and bars have a not so great aftertaste or texture. We found that both flavors of bars were tasty and satisfying. The protein bars are so convenient for those who don’t have time to bake like I do! The powders mixed in easily into our morning smoothies, shakes by themselves or of course, in the black bean brownie recipe listed below. All with great flavor and seriously affordable! 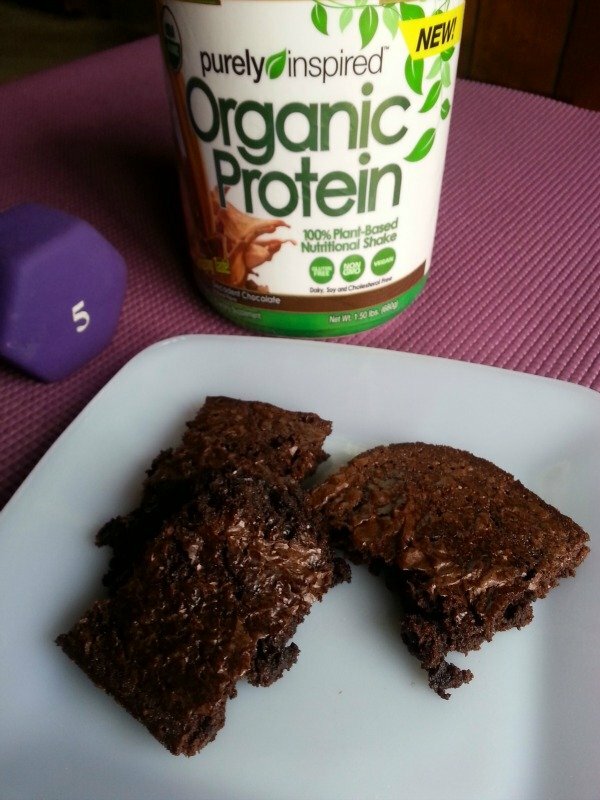 Check out our favorite high protein black bean brownie recipe and print it below! In blender or food processor add black beans, molasses and coconut oil and pulse until pureed. Mix in dry ingredients until everything is blended well. Bake for 20-25 minutes. Brownies will be soft and moist. Add this black bean brownie recipe featuring the tasty chocolate Purely Inspired® organic protein powder to your menu plan this week. Not only will this give you a healthy treat, it will help you keep on track with your diet and exercise program. When you feel satisfied you are less likely to indulge in bad foods, and more likely to stick to your workout and diet routine!